Thank you for giving! The generous contributions of our private donors, in addition to annual funding received from grants and from the state of Missouri, make it possible for Isabel’s House to provide 24/7/365 safe refuge for children. With your support, we provide over 3,000 nights of care each year! Isabel’s House (Crisis Nursery of the Ozarks, Inc.) is a registered 501(c)(3) non profit organization. Your financial and in-kind contributions are, in most cases, deductible on your state and federal income tax (if you itemize your deductions). We highly recommend discussing your charitable giving with your personal tax advisor. Our Development Team is here to help. If you have a question about your generous gift, please contact us right away at (417) 865-2273 ext. 303. *Cash or coin donations should be hand-delivered. Please do not mail cash or coins. Credit or Debit Card donations may be made online via our secure donation page. Isabel’s House relies on the regular, sustaining gifts made by members of our monthly giving program! When you begin a monthly gift, you can authorize Isabel’s House to make a regular, ACH withdrawal from your Checking or Savings account, or a regular charge to your Credit or Debit Card. The sum of your donation will be acknowledged annually for use in preparing your taxes, but the impact of your donation will be felt daily by the children and families who walk through our door. Contact us or start your monthly gift online today! 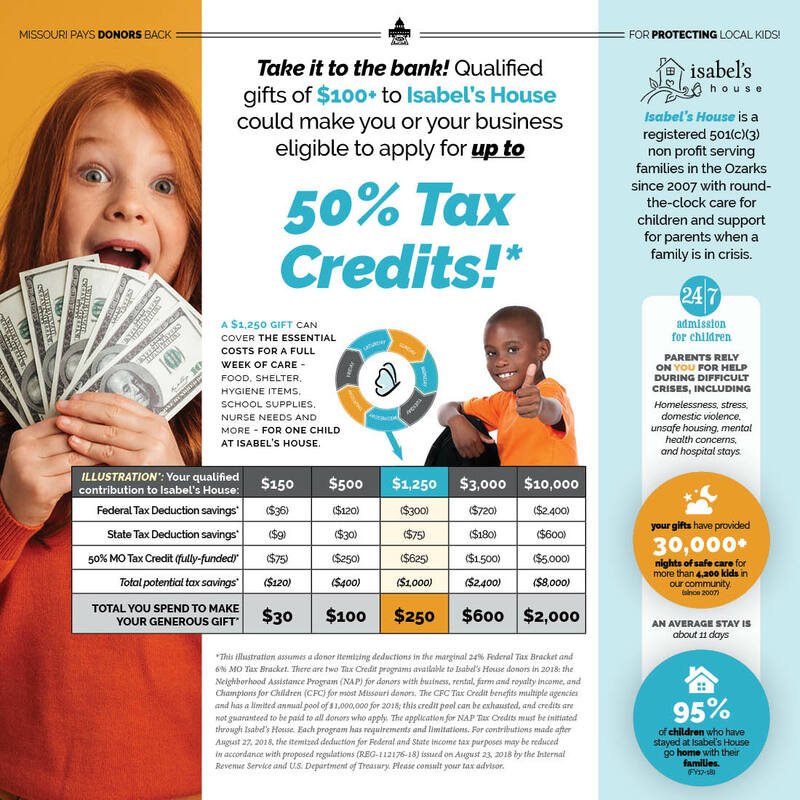 Isabel’s House is excited to give eligible donors of $100 or more residing in the state of Missouri the opportunity to apply for one of two Tax Credit programs (download illustration). The Champion for Children (CFC) Tax Credit allows qualified individuals and businesses to apply for up to a 50% credit for a contribution made to Isabel’s House. This tax credit requires basic documentation and submission of Form MO-TC with your Missouri tax returns. Click here for complete program details and limitations. NOW AVAILABLE FOR 2018. The Neighborhood Assistance Program (NAP) Tax Credit allows qualified businesses and individuals receiving certain types of business income (see eligibility requirements) to apply for up to a 50% credit for a contribution made to Isabel’s House. This credit requires more detailed documentation, and your application must be initiated through Isabel’s House. To check available Tax Credits for gifts to Isabel’s House, please contact our Development Team today at (417) 865-2273 ext. 303. Isabel’s House is honored to be a Children’s Trust Fund grant recipient. Did you know? Isabel’s House can benefit directly from your participation in the CTF “License to Care” specialty license plate program! Follow this link to learn more about making your $25 or more annual donation to CTF and designating Isabel’s House as your local partner, and join hundreds of fellow Isabel’s House supporters in displaying the CTF specialty plate and becoming a daily, public advocate for the prevention of child abuse and neglect! Making a special, one-time gift or an annual gift of appreciated securities (stocks, bonds, ETFs, etc.) is a great way to maximize your tax deductions, avoid capital gains taxes, and make a significant gift to Isabel’s House all at the same time. Donations of securities can also, in most cases, qualify you for one of the Tax Credit programs available to our donors, as outlined above! From time to time, Isabel’s House may also accept personal property and real estate if it supports the mission of Isabel’s House and meets certain criteria set forth by the Board of Directors. To discuss the process for making gifts of securities or property, please contact our Development Team today at (417) 865-2273 ext. 303. Planned gifts, and other gifts made to build our Endowment, allow your heart for children, families, and our community to keep giving in amazing ways. Your action today to endow our programs or to include Isabel’s House as part of your estate planning – even when your gift is deferred – makes you a “Pillar of Hope” for so many local parents working to provide a strong, stable home for their kids. Charitable Gift Annuities – transferring assets to Isabel’s House in exchange for a fixed income to yourself. Charitable Remainder Trusts – Transferring assets to a trustee to provide income to you for life, with the remainder balance coming to Isabel’s House upon your death. Charitable Lead Trusts – Transferring assets to a trustee to provide income to Isabel’s House for a fixed period of time, then reverting back to you or other beneficiaries. If your plan results in an irrevocable transfer, a partial tax deduction is usually possible for your heirs. Isabel’s House wants to recognize and thank donors of planned gifts who are living a lifetime of support for our mission. Please contact Holly Beadle, Executive Director, at (417) 865-2273 ext. 301 to share and discuss your planned gifts to Isabel’s House.